You can add background images to your rows and backgrounds. What's more is that you can also tint your background image with a color to make it fit better with your design. For example, I have here a row with a background image with some white overlaid text. It's quite hard to see the text right now because of the background image I picked. To make things look better, we can add some color to our background image. To do this, hover your mouse over the row, then click on the row's gear icon to open up its properties. 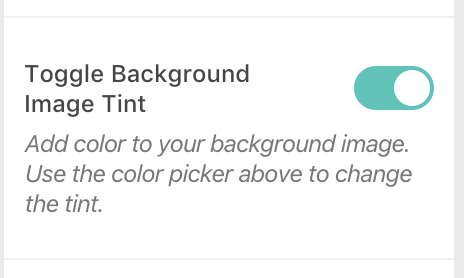 Go to the Background options, then turn on Background Image Tint.